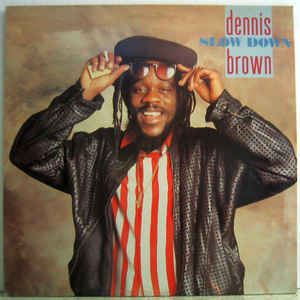 Dennis Brown had been around for quite a while by 1978. His one big hit, "Money In My Pocket" had been in 1978 and his more rootsy material dated from that time. Here, he joins with Gregory Isaacs and Prince Jammy on production duties. You can tell, it has a real Isaacs sound about it, particularly on the seductive slow skank of "Slow Down Woman". It is almost Lovers Rock in its ambience. "It's Magic" is a lively, pop opener too. These two get the album off to a great start. Yes, there are some eighties-style instrumentation in the slick, synthesised keyboards, but there are still some punchy horns and mid-tempo, skanking, rock-steady-ish rhythms all over the albums. 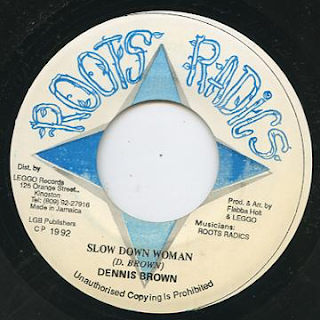 Brown's output was still always going to have a certain amount of roots feel to it. The Bob Marley meets Jacob Miller thump of "Joy In The Morning" had that slow grind to it, although it is praise of his woman, as opposed to Jah. Time for some Rasta consciousness, probably. This duly comes in the beautifully horn-driven, catchy "They Fight I". Even the cultural, devotional rootsier tracks are given an Isaacs-esque infectious poppiness that is hard to resist. The cover of John Holt's "Let's Build Our Dreams" has more Isaacs influence on it and it has the sort of brass-driven slow groove that UB40 used so much during the same period. In the same vein is "Come On Over" that sounds as if it has come straight off Isaac's "Night Nurse". These tracks are an appealing mix of rootsy depth yet rocksteady lightness, if that makes sense. UB40 were so influenced by "Love By The Score", surely. Ali Campbell sounds a lot like Dennis Brown at times. "Icy Road" and "Africa We Want To Go" are both roots tracks. The former has a rumbling rhythm and some portentous lyrics. The Burning Spear-like latter is the album's most typical roots cut in both sound and lyrics. Even these serious tracks, though, have an upbeat, catchy appeal to them, however. "Now And Forever" has a hint of Black Uhuru about it. "Can't Keep A Good Man Down" is almost funky in its addictive backbeat. "Live And Love" has a few eighties synth drum fills but it is still a kicking track. The sound on the whole album is truly sumptuous too, making it a joy from beginning to end.